As Command Module pilot on Apollo 17, the last and longest of the Apollo moon missions, Ronald E. Evans, orbited the moon alone for three days while crewmates Gene Cernan and Jack Schmitt explored below. Evans was born November 10, 1933, in St. Francis, Kansas. He received a Bachelor of Science degree in electrical engineering from the University of Kansas in 1956 and a Master of Science in aeronautical engineering from the U.S. Naval Postgraduate School in 1964. He received his commission as an ensign through the Navy ROTC program at the University of Kansas and in 1957 he completed flight training and served aboard aircraft carriers in the Western Pacific. In 1961 and 1962 he was a combat flight instructor for F8 jet pilots, after which he flew combat missions in F8s for seven months from the carrier USS Ticonderoga. NASA selected Evans as one of 19 new astronauts in April 1966. He was backup Command Module pilot on April 14 before being assigned that position on April 17, with Commander Gene Cernan and Lunar Module pilot Harrison H. (Jack) Schmitt. The final Apollo moon journey began with a thunderous post-midnight launch on December 7, 1972. Three days later the astronauts circled the moon and Cernan and Schmitt descended in their lunar ship “Challenger” to a mountain-ringed valley named Taurus-Littrow. While they drove their Lunar Rover across the surface in three separate excursions, Evans maintained a solo vigil in the command ship “America,” mapping the moon with a set of sophisticated cameras and scientific instruments. When “Challenger” again linked up with “America” the astronauts spent two additional days in lunar orbit to collect additional data. During the three-day trip back to Earth, Evans took a 1 hour-6-minute space walk to retrieve film and other data from the mapping instruments. The longest Apollo lunar mission – 301 hours, 51 minutes – ended with a December 19 splashdown in the Pacific Ocean. 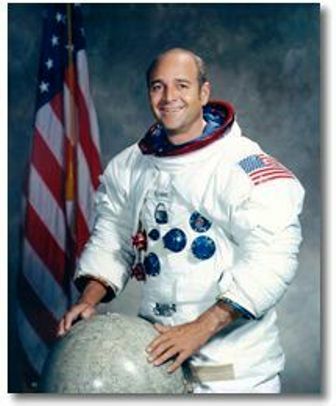 Following the flight, Evans served as backup Command Module pilot for the 1975 joint U.S.-Russian space mission, Apollo-Soyuz, and then became involved in development of the Space Shuttle. He retired as a captain from the Navy in 1975 and from NASA in March 1977 and became director of Space Systems Marketing for Sperry Flight Systems in Phoenix, Arizona. He died April 6, 1990, of a heart attack in Scottsdale, Arizona. Ronald Evans was inducted into the U.S. Astronaut Hall of Fame on October 4, 1997.